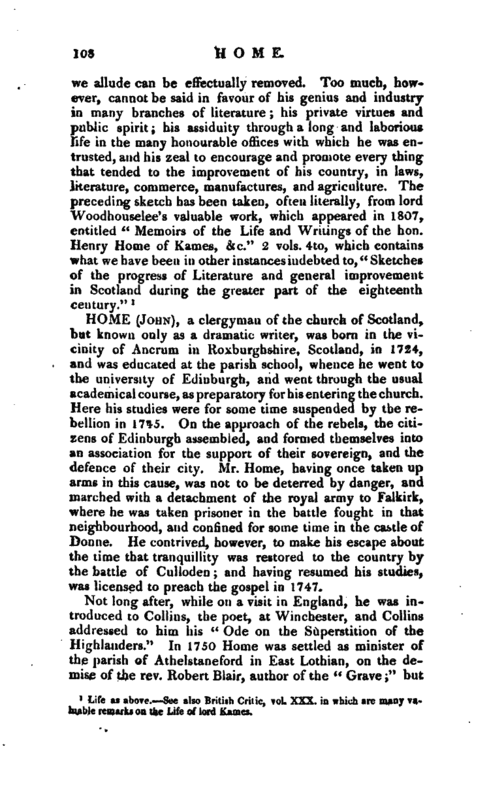 , a clergyman of the church of Scotland, but known only as a dramatic writer, was born in the vicinity of Ancrum in Roxburghshire, Scotland, in 1724, and was educated at the parish school, whence he went to the university of Edinburgh, and went through the usual academical course, as preparatory for his entering the church. Here his studies were for some time suspended by the rebellion in 1745. On the approach of the rebels, the citizens of Edinburgh assembled, and formed themselves into an association for the support of their sovereign, and the defence of their city. Mr. Home, having once taken up arms in this cause, was not to be deterred by danger, and inarched with a detachment of the royal army to Falkirk, where he was taken prisoner in the battle fought in that neighbourhood, and confined for some time in the castle of Donne. He contrived, however, to make his escape about the time that tranquillity was restored to the country by the battle of Culloclen; and having resumed his studies, was licensed to preach the gospel in 1747. Not long after, while on a visit in England, he was introduced to Collins, the poet, at Winchester, and Collins addressed to him his “Ode on the Superstition of the Highlanders.” In 1750 Home was settled as minister of the parish of Athelstaneford in East Lothian, on the demise of the rev. Robert Blair, author of the “Grave;” but | such a situation could not be very agreeable to one who had tasted the sweets of literary society, and who, in particular, had a paramount ambition to shine as a dramatic writer. 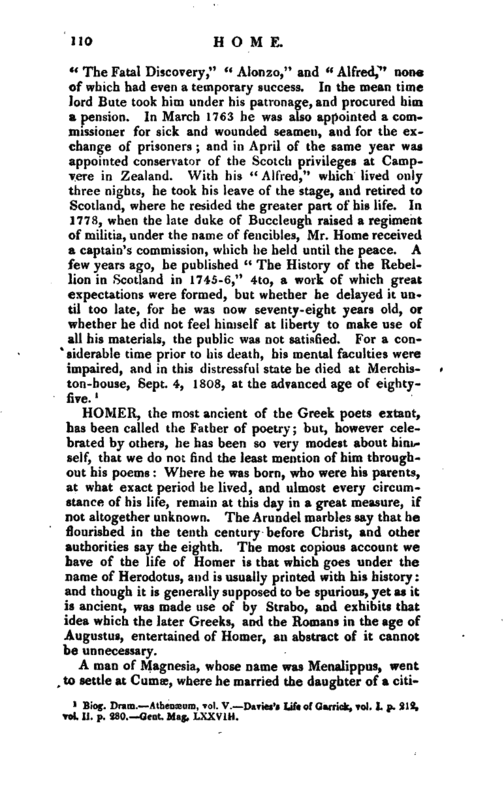 His first tragedy was “Agis,”“with which it is said he went to London, where the managers refused it, and immediately returning home he wrote his” Douglas,“which Garrick peremptorily refused. By such discouragement, however, the ardour of the author was not to be suppressed. 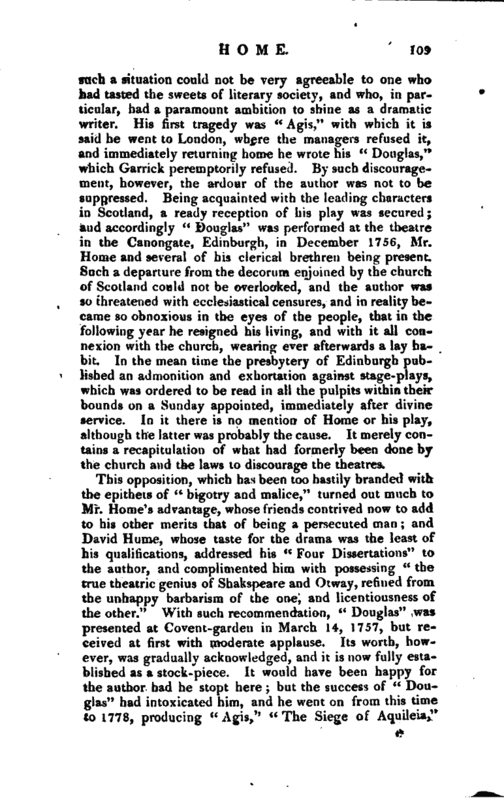 Being acquainted with the leading characters in Scotland, a ready reception of his play was secured; and accordingly” Douglas" was performed at the theatre in the Canongate, Edinburgh, in December 1756, Mr. Home and several of his clerical brethren being present. Such a departure from the decorum enjoined by the church of Scotland could not be overlooked, and the author was so threatened with ecclesiastical censures, and in reality became so obnoxious in the eyes of the people, that in the following year he resigned his living, and with it all connexion with the church, wearing ever afterwards a lay habit. In the mean time the presbytery of Edinburgh published an admonition and exhortation against stage-plays, which was ordered to be read in all the pulpits within their bounds on a Sunday appointed, immediately after divine service. In it there is no mention of Home or his play, although the latter was probably the cause. It merely contains a recapitulation of what had formerly been done by the church and the laws to discourage the theatres. Biog. Dram. Athenxum, vol. V. Davies’s Life of Garrick, vol. I. p. 212, vol. II. p. 280. —Gent. Mag. LXXVIII.